LOS ANGELES - Japan’s beloved blue robotic cat from the 22nd century is finally making his U.S. debut this summer, promoted as part of the Cool Japan campaign to export the country’s pop culture around the world. 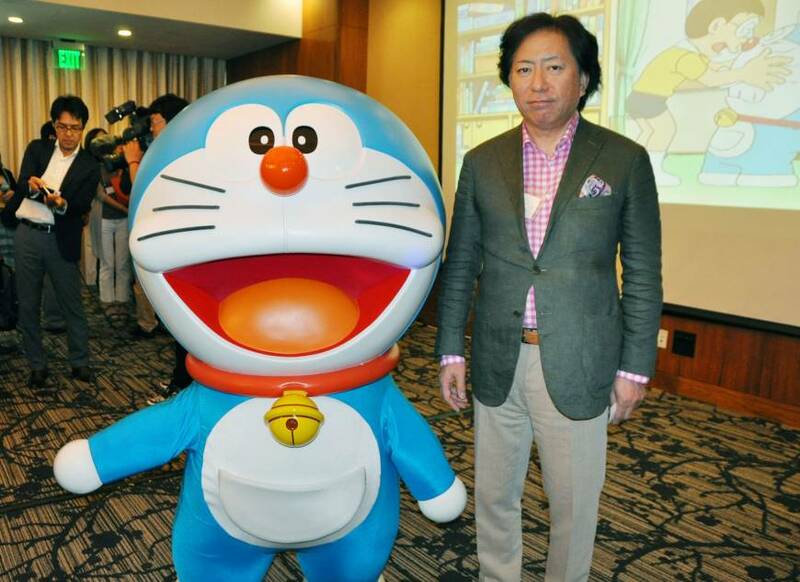 The Japan External Trade Organization held a “Doraemon” launch party Friday in Torrance, California, for media and about 80 primarily Japanese companies to encourage businesses to pursue licensing opportunities to promote the character in the United States. The show will premier July 7 on Disney XD, a cable channel mainly targeting elementary school children. A total of 26 episodes will be broadcast, with episodes airing weekdays at 12:30 p.m. The animated series, based on the manga written by the late Fujiko F. Fujio between the latter half of the 1960s and the mid-1990s, has been aired in 35 other countries and regions, mainly in Asia and Europe. He also noted that many people in Japan are surprised when they find out that “Doraemon” has never been broadcast in the United States before. “Everybody says, ‘Haven’t they had it yet?’ instead of saying ‘Congratulations,’ to me,” he said. Maiko Watanabe, logistics manager of Nippon Express U.S.A. Inc.’s Los Angeles branch in Torrance, said her company is interested in learning more about licensing the Doraemon character, possibly for use on its trailers that make deliveries across the United States. Watanabe said she thinks the company could benefit from the association with a cute, well-known character, and it could also help familiarize American people with Doraemon, so everyone would benefit. Attendees of the JETRO event were also treated to an episode of “Doraemon” from the English series. Similar to the English-language version of the “Doraemon” manga released digitally on the Amazon Kindle last year, characters, food and other items in the cartoon have been tweaked to suit U.S. audience preferences. Doraemon’s name will remain the same, but the character Nobita has been renamed Noby, Shizuka is Sue, Suneo is now Sneech and Gian is Big G.
Noby’s pocket money is in dollar bills instead of yen, a food stall selling Shizuka’s favorite baked sweet potatoes has been changed to a popcorn stand, and to promote healthy foods, “manju” bean-jam snacks are replaced with fruits. According to TV Asahi Corp., which airs “Doraemon” in Japan, some scenes, like those of Gian beating up Nobita, and Shizuka taking a bath, will be deleted or shortened in line with U.S. broadcast regulations that ban images of violence as well as sexual and discriminatory content in animation for children. Broadcasts of the show in other countries have used the Japanese version, adding only subtitles or voices dubbed in the local language. 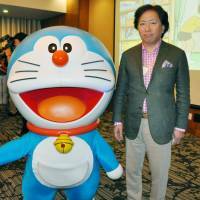 This will be the first time “Doraemon” will be truly localized. Bang Zoom Entertainment Inc., an audio post- and creative production studio based in Burbank, California, has worked on producing the U.S. version. He said the studio has sometimes spent several weeks deciding on the right choice of words to use in the U.S. version of “Doraemon” so as to deliver the cartoon in the best possible form. Johnny Yong Bosch, who voices Noby and has provided English voices for a number of anime and video game characters, said he is looking forward to sharing the joys of “Doraemon” with viewers not just in the United States but all over the world.